StainLifters uses the utmost care when cleaning your furniture and upholstery, and even delicate fabrics are no problem. We can also deodorize and apply a protectant if desired. 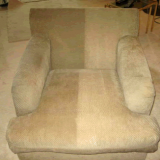 If you want your upholstery to look new again, Contact StainLifters today!